Kickstarter’s Zine Quest and Some Great Zines! In November 2018, Kickstarter announced their upcoming [at the time] February initiative, Zine Quest. Since then, life has been about maintaining my schedule while preparing and running two RPG zines for the initiative, POWERED by the DREAMR and Love’s Labour’s Liberated for 5e (with John McGuire and Leland Beauchamp). While PbtD has funded, LLL continues until this Saturday. As a wrap up to my first two Kickstarters, I decided to reach out to some of my fellow Zine Questers to ask what RPG zines on Kickstarter that they’re interested in reading/playing? What follows are their responses. NOTE One: I asked each contributor separately, so they didn’t know that they’d be together in the article. Thus, when they praise each other’s games, it’s genuine. NOTE Two: I specifically asked each commenter to avoid “anything lame like false praise of my KS project. While I’d take a shout out, I want your honest recommendation(s).” I say this because some of these knuckleheads recommended my project and, while I’m flattered, I don’t want it to seem like it’s nepotism (it’s more like inept-ism… or maybe they genuinely like them). Ends: Sun, March 3 2019 10:04 AM EST. “Okay, Love’s Labour’s Liberated, for reals. I think the approach is exactly the kind of mechanics that support rich RP campaigns. synthesis. Just the premise seems incredible and a zine full of mini-rpgs is perfect for my own indie tastes. Love’s Labour’s Liberated ends Sun, March 3 2019 1:33 AM EST. synthesis. ends Wed, March 13 2019 2:34 PM EST. Girl Underground ends Tue, March 5 2019 9:00 PM EST. Ends: Sun, March 3 2019 2:19 PM EST. “Hey! I am the creator of The Epic of Dreams RPG, and the ringleader for the Harrowings From the Rime OSR Zine. There are so many legit projects happening in this movement, it’s a lot to take in. Three zines I’m really hyped about are What Happened at Wyvern Rock?, POWERED by the DREAMR, and Other Magic. What Happened at Wyvern Rock has a great premise. The aliens and 50’s era superstitions mixed with the medieval setting has so many possibilities. The best part about this zine to me, so far, is simply the execution and art style. The specific way they’re tackling this fusion wets my hunger like nothing else. And it’s going to be 64 PAGES! They’re mad, and I love it. Can’t wait. POWERED By The DREAMR is being made by my friend, Egg! I have been able to participate in a handful of PbtA games, and I love the overall design. DREAMR is great because it fuels poetic collaboration in roleplaying, which is one of the major themes in my own game, The Epic of Dreams. Anything that is able to elicit those inspired moments in roleplay automatically gets my support. I’m really looking forward to seeing how the class abilities turn out! Dream sorcery for DAYS! What Happened at Wyvern Rock? ends Sun, March 3 2019 7:36 AM EST. POWERED by the DREAMR ended but is available until Sun, March 3 2019 1:33 AM EST through Love’s Labour’s Liberated. Other Magic ended by the time this article went live. Ends: Wed, March 6 2019 3:26 PM EST. “I actually really am looking forward to your zines, especially POWERED by the DREAMR. I adore hacks of Powered by the Apocalypse. For POWERED by the DREAMR, it looks like the perfect system to portray a delve into the most mysterious parts of the psyche. I really can’t wait to see what stories I can tell with it. Ends: Fri, March 8 2019 3:28 PM EST. “This was a rough one considering I’ve backed or am backing 18 Zine Quest participants… That being said, these are the two I’m most excited to run/read/play. Dino Wranglers. I love that Dino Wranglers is an easily accessible and inclusive in design, but still looks really rad and epic. I want a game I can teach to the kids at my library. Dino Wranglers ends Thu, March 28 2019 11:08 AM EST. Draugr & Draculas ends Wed, March 27 2019 8:48 AM EST. Ends: Wed, March 13 2019 2:34 PM EST. “I’m very excited for my friend Erika Shepherd’s zine, Exodus, a game about trans angels on a road trip that uses the Belonging Outside Belonging system. The campaign will have just ended by the time this article goes up, but you can still get the pdf at fadingroots.itch.io/exodus! Exodus ended by the time this article went live. Ends: Thu, March 21 2019 8:00 PM EST. “Casket Land: This occult/weird west zine is a full game packed into the pages of a zine. The game is engine is Powered by the Apocalypse, which I’m not a huge fan of, but the writing, layout and killer high-contrast black and white art were enough to get me to back it. Just check out the example pages on the it’s campaign page and you’ll see that this zine is just dripping with flavor and style. Cade’s Big Book o’ Booze is an alcohol related zine for use with any 5th edition fantasy, which I’ll convert it’s content to OSR for games, but I’m really looking forward to this one. There’s going to be rules for the condition: intoxicated, new weapons and equipment, magic spells and magic items, maybe just maybe I’ll get to make that Jackie Chan Drunken Master Monk I’ve always wanted to play! A Pound of Flesh is a zine module for the Sci-Fi Horror OSR RPG Mothership, which itself was also a zine. Mothership was a modern marvel of modern layout and game design and so I was really excited to see what all A Pound of Flesh would bring to the table. Plus, it’s being written by Chance Phillips, a rising star in the ranks of the OSR, who’s done some really great stuff for Lamentations of the Flame Princess. 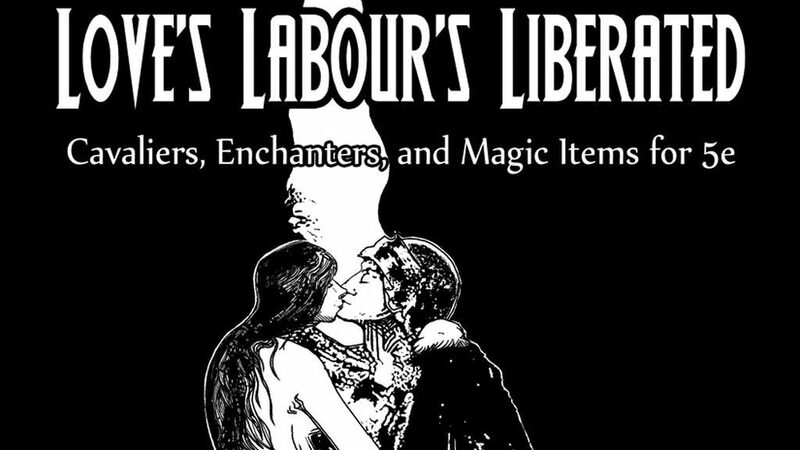 Love’s Labour’s Liberated – Cavaliers, Enchanters and Magic Items for 5e fills a void that is quite overlooked in roleplaying games, romance. A significant portion of fantasy fiction is dedicated to this genre but it’s definitely overlooked in the gaming materials. Casket Land ends Sat, March 9 2019 12:00 AM EST. Cade’s Big Book o’ Booze ends Fri, March 8 2019 3:28 PM EST. A Pound of Flesh ends Thu, March 7 2019 9:00 AM EST. Dead Halt ended by the time this article went live. NOTE: POWERED by the DREAMR (a Powered by the Apocalypse zine) by Egg Embry is available through the Love’s Labour’s Liberated for 5e Kickstarter campaign. 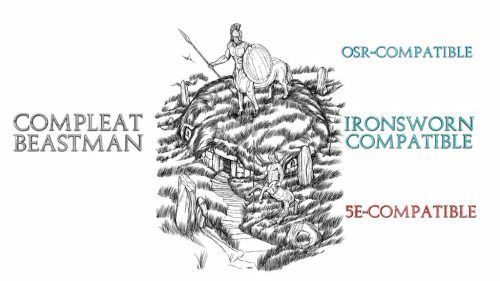 Eric Bloat is expanding his OSR horizons again. This time, you get to play Amazons. The art is perfect, the concept is the right amount of bringing classical stories forward, it’s OSR, something Eric (literally) wrote several books on, and it’s waiting for you – The Isle of The Amazons – RPG Zine for #ZineQuest. Drew Cochran’s Harrowings From The Rime! 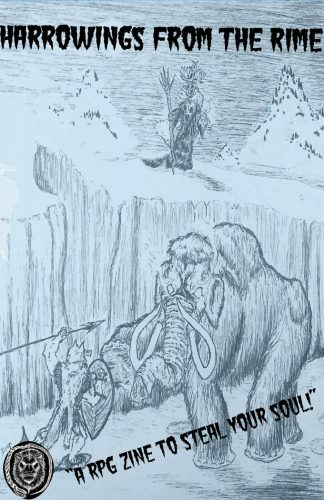 is an arctic setting that will make every OSR a colder place to play in. I’m eager to play in the frozen lands where the enemies and elements compete to see which is deadlier! Sean Hillman is bringing new voices into gaming through D.I.R.G.Ezine. This one is exciting because I game with Sean (he lives in metro Atlanta) and it includes work from Dawn Gilreath, another gamer in our group, and the Tessera Guild’s own award winning artist, Amanda Makepeace. It’s going to shine! Justin Ryan Isaac is one of the newest, smartest creators starting in OSR. He’s doing a 5e zine about booze and, as his first project, it’s more than finding its audience! Cade’s Big Book o’ Booze is humorous and useful (cause Drink & Dragons is real) so this zine will be what he’s known for until his “big” work arrives. Riley Rethal and I have talked a bit since I found synthesis. We discussed her ambitions to do a long-form RPG using a favorite property, and the cliff note ideas she shares are the perfect tone for the project. 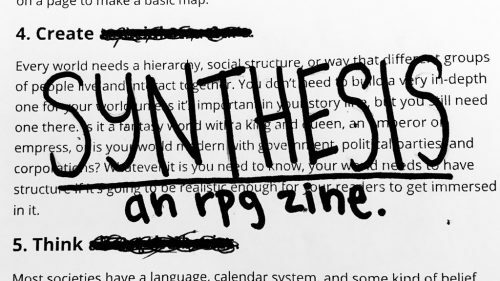 The excitement around that work, the zine, and RPG in general, is infectious and I know it will make synthesis a win! For the zine, the concept, multiple succinct RPGs, speaks to me as it gives you a variety of options to play and, I feel, it will open up new avenues of design through sheer originality. Jacob DC Ross is adding beastmen and miniatures to your OSR game, and, if you’re a publisher, stock art to your library. I love books/zines of monsters, so that’s a win. Adding the minis makes it even better. But, as an individual with two zines coming out, RPG Zine Challenge: The Compleat Beastman is an excellent return on my investment as a publisher. Looking at the sample art, I’m excited about this! D.I.R.G.Ezine ends Sun, March 3 2019 10:04 AM EST. Harrowings From The Rime! ends Sun, March 3 2019 2:19 PM EST. 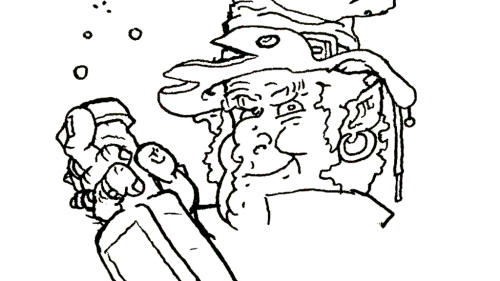 RPG Zine Challenge: The Compleat Beastman ends Wed, March 6 2019 3:26 PM EST. 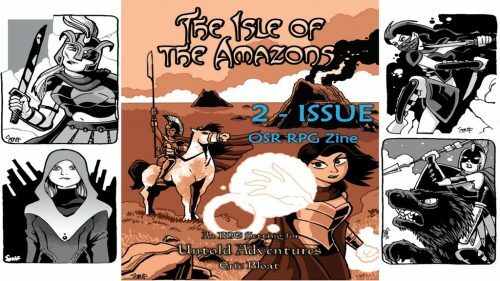 The Isle of The Amazons – RPG Zine for #ZineQuest ends Thu, March 21 2019 8:00 PM EST. Love’s Labour’s Liberated introduces the theme of February, love, into your 5e campaign. Part of Kickstarter’s RPG Zine Quest, this publication focuses on a romanticized view of Cavaliers, Enchanters, Magic Items, and more for the world’s most popular roleplaying game. Each component is designed to be a hook that draws the player into the game utilizing character motivations. This zine will enhance the roleplaying flavor of the classes while offering chances for characters to buy-in to the setting and its challenges. Focusing on a new version of the fighter archetype, the Cavalier of Love, a 5e-realized Enchanter, and Magic Items with lovely story hooks, these rules expansions ramp up the quiet moments between combat. Each chapter will lead with a stanza of poetry by Leland Beauchamp. These pieces can standalone or be combined as an adventure hook. Through this zine, you’ll experience the creator’s love of roleplaying and 5e, and be able to share it with your table. Love’s Labour’s Liberated for 5e by John McGuire, Leland Beauchamp, and Egg Embry. An RPG zine focusing on romance and love in fantasy is available during Kickstarter’s Zine Quest. POWERED by the DREAMR is a full Powered by the Apocalypse tabletop roleplaying game in a zine, and it’s live on Kickstarter. In POWERED by the DREAMR, you are a Dreamr who possesses limitless powers within other’s dreams. Until you wake, you travel between the subconscious of sleepers, living out their dreams, searching out their secrets, or battling nightmares. Set in a dream state you and your friends collaborate on, this game maximizes the narrative rules to give each dream a surreal quality. As you navigate an ever-evolving universe of dream logic, your Moves will lead to success, reveal hidden truths, result in laughter, or unleash your character’s nightmares. Using a variant of the Powered by the Apocalypse phenomenon (originally seen in Apocalypse World as well as Monsterhearts 2, Dungeon World, and more), this game keeps dreams vibrant and varied via random questions that alter the fantasy or reveal a characters personal demons. You decide the dream objectives you must complete before the sleeper wakes. Will you combat a supernatural killer? Steal secrets? Defend the sleeper from dream thieves? Inspire a life altering dream epiphany? Live out your fantasy life? Or something wholly original? 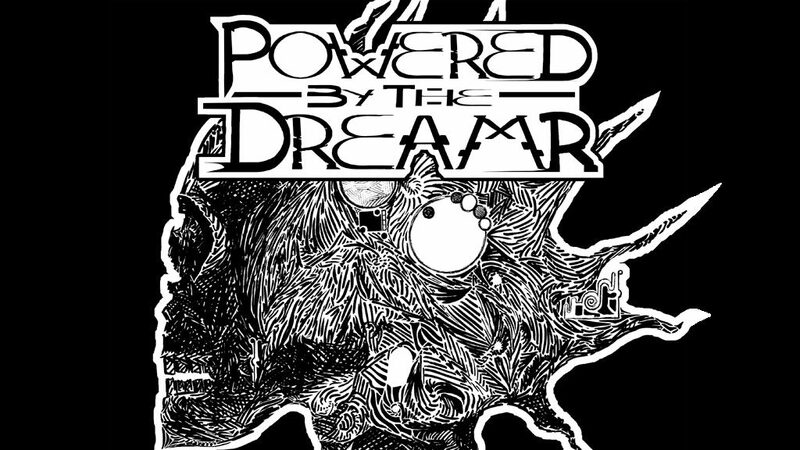 POWERED by the DREAMR by Egg Embry uses a variant of the Powered by the Apocalypse system. A full RPG in a zine that lets you live out other’s dreams or combat nightmares, it’s available through Kickstarter’s Zine Quest.